The two gender binary system is neat and tidy for a society that has constructed roles and expectations around each term, with there being no common ground between the two. It was not always this way. In antiquity there is ample evidence that there were many genders exhibited, as referenced in classical writing. The advent of Abrahmaic religion resulted in a series of stories that were written to encourage people who had been persecuted in their own land by imperialist invaders to engage in and promote behaviors -- such as reproduction for the sake of self-preservation, and therefore set the binary. These texts later became fodder for those who would persecute both them and us. In this world, one was either male or female. Genders outside of the binary were ignored. Sexual orientation and activity of those other than would potentially produce offspring, became demonized by a society based on biblical concepts. In a world of only two choices, I became very self-aware that I had been placed in the wrong box and that everything about me -- my sense of self, my behaviors, my likes and dislikes, were mostly assigned a female gender by those around me. Physically and genetically I was always between the two, but in a world where there were only to options, at first it made sense for me to try harder to behave as masculine as I could; particularly under the influence of a parent for whom my mannerisms had become embarrassing to the point where they felt the need for physical correction. Yet despite overcompensation in many areas, boys just didn't wear pink lip-gloss and blue eyeshadow while they were walking around town on weekends when not playing with their bands. I did. When I became aware of what it means to be transgender, my new-found awareness gave me a solution. I could transition to further align my body with my gender. As time progressed I felt the need to suppress any behaviors or thoughts that were socially gendered male lest I be further rejected by both external society and the transgender community, so once more attempted to fit the expectation of the gender binary, though now female rather than male. Trans originated as a shortened form of transgender, which includes myself and all other non-binary identities. However In the activist community, trans has largely become a more politically correct form of the word transsexual; touted as more inclusive, but yet still as exclusionary. Because of this, in saying that I am a trans woman, the listener usually forms the assumption that I am both transitioning and binary-identifying. 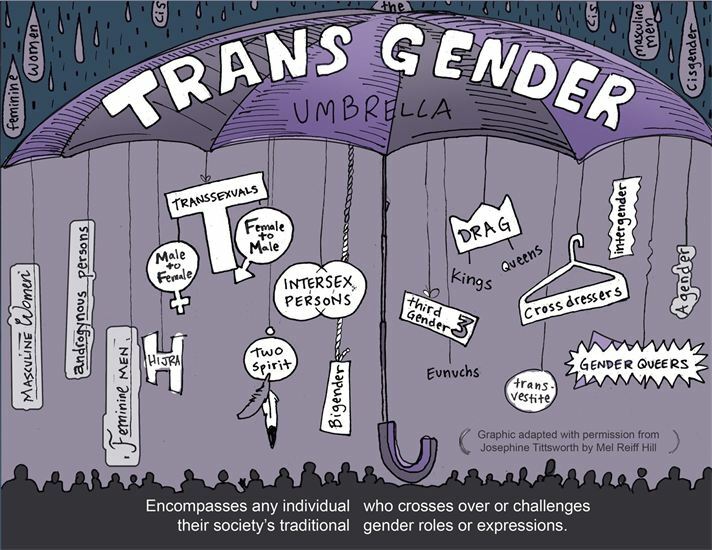 If we accept the true meaning of trans as being all of us under the umbrella term, then saying that I am a trans woman does not exclude my being a feminine-of-center transgender person transitioning towards a physiology that more closely matches but does not thoroughly encompassmy identity. I am non-binary in a world where Male and female are just two terms that sit on opposite ends of a line. I exist upon that line, at the high end of the female spectrum. My presentation generally reflects this. However, while some non-binary people identify more towards either male or female, others exist more towards the center, at various points along the line, or don't identify as a gender at all. The increasing use of trans and transgender when writing solely about those who are in transition or who have transitioned is inadvertently damaging the umbrella and erasing identities. According to the only study done of it's kind, "A Gender Not Listed Here", the differences between those who identify with a trans binary identity and those identifying as a non-binary trans identity shows that it's time that those of us under the umbrella that have a binary trans identity to take a difficult look at themselves and examine their privilege. Yes, I said privilege. With the legal protections added in various states, D.C., and the federal government's acknowledgement that trans people are covered by the Civil Rights Act and Title IX, there exists a clear area of opportunity for language to be added to ensure transgender related healthcare providers are adhering to the current WPATH standards so that at least in basic care services no trans person is excluded based on where they identify under the transgender umbrella. There is also a need for those non-binary identities who are not almost at one end of the spectrum or the other, to have their identities officially and legally recognized. Facebook added almost 50 different gender options and combinations to their users in 2014, largely due to the work of Brielle Harrison, who is a trans woman working for the company. If a corporation such as Facebook can add gender options, so can the federal government here in the U.S., and other Western countries such as the U.K. The simple inclusion of an "other" option where one can write in one's own gender with the addition of a preferred pronoun would be simple enough to incorporate on the vast majority of current forms. The issues are not particularly difficult to address -- most of the protections are already in place in a large number of states. We simply need to amend our language to ensure the inclusion of all those under the transgender umbrella when discussing trans issues, and not just the few who take steps to transition towards the opposite binary option from the one coercively assigned at birth.